The epithelial sodium channel (ENaC), a member of the ENaC/DEG superfamily, regulates Na+ and water homeostasis. ENaCs assemble as heterotrimeric channels that harbor protease-sensitive domains critical for gating the channel. Here, we present the structure of human ENaC in the uncleaved state determined by single-particle cryo-electron microscopy. The ion channel is composed of a large extracellular domain and a narrow transmembrane domain. The structure reveals that ENaC assembles with a 1:1:1 stoichiometry of α:β:γ subunits arranged in a counter-clockwise manner. The shape of each subunit is reminiscent of a hand with key gating domains of a ‘finger’ and a ‘thumb.’ Wedged between these domains is the elusive protease-sensitive inhibitory domain poised to regulate conformational changes of the ‘finger’ and ‘thumb’; thus, the structure provides the first view of the architecture of inhibition of ENaC. The bodies of humans and other animals contain many different fluids that play vital roles in the body, such as blood, saliva and the fluids that surround cells in organs. These fluids all contain particles called ions, which can affect the flow of water into and out of cells and alter the activity of proteins. Therefore, in order to survive, an animal must tightly regulate the levels of ions in its body. Epithelial cells line the surface of organs, and the inside of the digestive system and other cavities in the human body. A channel known as ENaC is found on the surface of epithelial cells and controls the volume of the fluid surrounding cells, blood pressure and the volume of liquid in the airways. This channel spans the membrane surrounding each epithelial cell and allows sodium ions to pass into the cell. To promote the opening of the channel, enzymes remove portions of the ENaC called extracellular domain, which sits on the outside surface of an epithelial cell. Three components (or ‘subunits’) called alpha, beta and gamma are needed to form an ENaC, but it is not clear how they fit together to form a single working unit. Noreng et al. used a technique called cryo-electron microscopy to study the three-dimensional structure of the human ENaC. This revealed that a single channel contains one alpha, one beta and one gamma subunit, which sit next to each other to form a narrow tube through the membrane and a large extracellular domain. When viewed from the outside of the cell the subunits form a narrow ring in a counter-clockwise manner. Further analysis of the structure suggested that when enzymes remove pieces of the extracellular domain of ENaC, it becomes easier for the rest of the channel to adopt a shape that allows sodium ions to move through the pore. A next step will be to study the three-dimensional structure of ENaC when it takes on different shapes to better understand how it works. The fine-tuning of Na+ homeostasis is largely mediated by epithelial sodium channels (ENaC) that are related in amino acid sequence to acid-sensing ion channels (ASIC) found in eukaryotes, degenerin channels (DEG) of Caenorhabditis elegans, and the FMRF-amide peptide-gated channels (FaNaCh) of mollusk (Driscoll and Chalfie, 1991; Chalfie and Wolinsky, 1990; Kellenberger and Schild, 2002; Waldmann et al., 1997a; Waldmann et al., 1997b; Krishtal and Pidoplichko, 1981; Chelur et al., 2002; Garty and Palmer, 1997; Cottrell et al., 1990; Lingueglia et al., 1995). These ion channels belong to the voltage-independent, Na+-selective, and amiloride-sensitive ENaC/DEG superfamily which together perform diverse cellular functions in different organisms. In humans, ENaCs are expressed at the apical surface of epithelial tissues throughout the body, and play critical roles that range from regulation of total-body salt, water, and blood volume, to modulating airway surface liquid clearance in epithelial cells in the lungs (Büsst, 2013; Ismailov et al., 1996; Rossier et al., 2015; McDonald et al., 1994). The importance of ENaC in Na+ homeostasis is highlighted by gain-of-function mutations causing severe hypertension, as in Liddle syndrome, or loss-of-function mutations causing the neonatal salt-wasting disorder pseudohypoaldosteronism type 1 (PHA-1) (Gründer et al., 1997; Hansson et al., 1995; Shimkets et al., 1994; Chang et al., 1996; Edelheit et al., 2005; Kerem et al., 1999). More subtle ENaC dysfunction contributes to diseases as diverse as essential hypertension, heart failure, and nephrotic syndrome (Soundararajan et al., 2010; Hamm et al., 2010; Zheng et al., 2016). ENaCs require three different subunits to form a functional channel, α, β, and γ (Canessa et al., 1994). Despite decades of study, the number of subunits in an active channel remains unclear (Shobair et al., 2016). Unique among the ENaC/DEG channels, ENaCs are activated by proteolysis of peptidyl tracts embedded in the extracellular domain (ECD), which releases inhibitory peptides. The cleavage event increases channel opening probability, Po (Orce et al., 1980; Vallet et al., 1997; Vallet et al., 2002; Vuagniaux et al., 2002; Hughey et al., 2004; Hughey et al., 2003; Caldwell et al., 2004; Passero et al., 2010; Kleyman et al., 2009). Amino acid sequence alignments and biochemical analyses in the ECD have so far revealed that only the β subunit lacks the characteristic motifs for protease recognition. ENaCs are widely known as substrates of serine proteases like furin, and a growing list of proteases that recognize sites in ENaC suggests a multifaceted regulation of channel function (Rossier and Stutts, 2009). Indeed, the complexities of ENaC function involving the requisite heteromeric subunit assembly and asymmetric subunit modification via differential proteolytic processing are critical to ion channel gating. Thus, to define subunit arrangement and stoichiometry, and elucidate the molecular architecture of ENaC inhibition, we determined the structure of ENaC in the uncleaved state by single-particle cryo-electron microscopy (cryo-EM). We first assessed the expression of full-length (FL) ENaC by small-scale expression in adherent HEK293S GnTI- cells and fluorescence-detection size-exclusion chromatography (FSEC) (Kawate and Gouaux, 2006). We found a low, wide peak, indicating a poorly expressing polydisperse population unsuitable for cryo-EM (Figure 1a). We thus screened a number of deletions and mutations in each ENaC subunit, harnessing information derived from previous biochemical and functional experiments gauging the propensity for heterotrimeric formation of ENaC and its susceptibility to proteolytic processing (Canessa et al., 1994; Orce et al., 1980; Vallet et al., 1997; Vallet et al., 2002; Vuagniaux et al., 2002; Hughey et al., 2004; Hughey et al., 2003; Caldwell et al., 2004; Passero et al., 2010), before arriving at the construct referred to here as ΔENaC (Figure 1a–c, Figure 1—figure supplement 1, Figure 1—figure supplement 2). Creation and analysis of ∆ENaC. (a) Representative FSEC traces of full-lenth ENaC (FL-ENaC, red) and ∆ENaC (black). (b) Summary of mutations in ∆ENaC. (c) Summary of ∆ENaC constructs. (d) Representative 2D class averages of ∆ENaC show that pseudosymmetry inherent in ENaC hampers particle alignment. (e) Representative 2D class averages of ∆ENaC-7B1/10D4 complex showing increased detail due to alignment aid from Fabs. ΔENaC is composed of αβγ subunits truncated at the N- and C-termini (Figure 1b,c). Additionally, the Δα and Δγ subunits possess mutations in the identified furin and prostasin sites which prevent subunit cleavage and channel activation (Hughey et al., 2003; Bruns et al., 2007). For protein purification, neither Δα nor Δβ were modified with affinity tags because there is strong evidence that the α subunit can readily form functional homomeric channels, and the termini of Δβ are sensitive to perturbations (Canessa et al., 1993). As a result, Δγ contains both GFP and a Strep-II tag at the N-terminus (Figure 1c), minimizing contamination by homomeric Δα channels during purification. This construct provided a homogeneous and highly-expressing population. However, the inherent pseudosymmetry from common secondary and tertiary structures between the α, β, and γ subunits of human ENaC hindered particle alignment (Figure 1d). 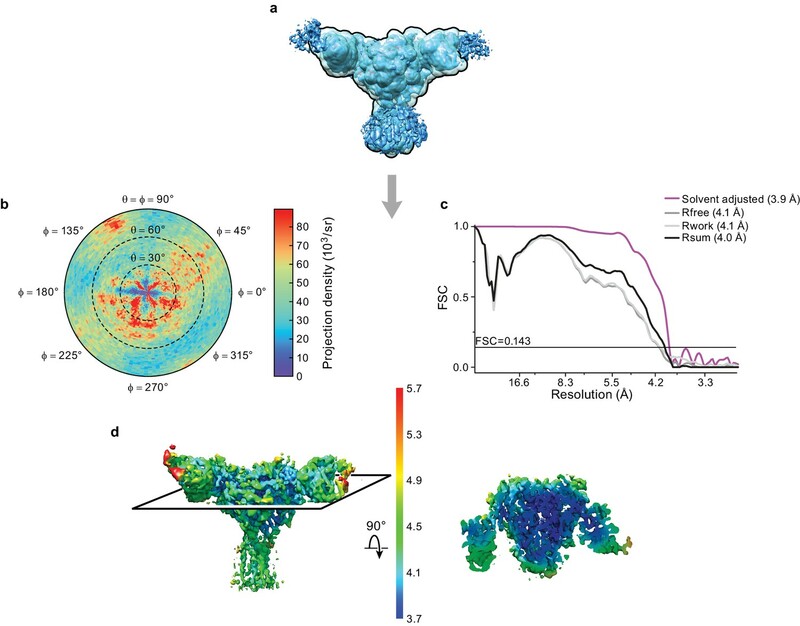 To evaluate biochemical integrity and to facilitate cryo-EM three-dimensional reconstruction of ΔENaC, we generated subunit-specific monoclonal antibodies (mAbs) that bind to three-dimensional epitopes in ΔENaC and FL-ENaC. For immunization, we exploited the high-expressing chicken ASIC (cASIC) by adding the first 22 N-terminal amino acids of cASIC to Δβ, which tolerated the fusion. This construct is referred to hereafter as ΔβASIC. Together, Δα, ΔβASIC, and Δγ comprise ΔENaCASIC (Figure 1—figure supplement 3a,b) (Jasti et al., 2007). Two fragment-antigen binding domains (Fabs) were isolated that recognize different epitopes (7B1 and 10D4). While these antibodies were raised against ΔENaCASIC (Figure 1—figure supplement 3a,b), both Fabs bind to both ΔENaC expressed in HEK 293S GnTI- and FL-ENaC expressed in HEK293T/17, which indicates that ΔENaC is properly folded and that the Fabs do not bind to the ASIC segment (Figure 1—figure supplement 3c,d; Figure 1—figure supplement 4a,b). Inclusion of 7B1 and 10D4 allowed for proper alignment of the particles (Figure 1e). Moreover, maps of the particles with only 10D4 (monoFab) compared to those with both 10D4 and 7B1 (diFab) show that each Fab recognizes only one subunit (Figure 1—figure supplement 4c–f). We monitored and compared grid conditions and the resulting data quality (including ice thickness, sample quality, particle distribution, and orientation) between the monoFab and the diFab complexes of ENaC and discovered that the diFab complex was a more promising complex for cryo-EM analysis. We investigated ΔENaC function by two-electrode voltage-clamp electrophysiology (TEVC) and whole-cell patch clamp electrophysiology in oocytes and GnTI- HEK cells, respectively (Figure 2, Figure 2—figure supplements 1 and 2a and b). Unlike FL-ENaC (Figure 2a, Figure 2—figure supplement 2a), ΔENaC does not exhibit amiloride-sensitive currents in oocytes and HEK cells, and the only Na+-specific currents resemble those from uninjected oocytes (Figure 2—figure supplement 1a,b). Similarly, oocytes expressing ENaC channels with restored protease sites in the Δ subunits (Δα* and Δγ*) to form Δ*ENaC did not present amiloride-sensitive currents (Figure 2—figure supplement 1c). Because HEK cells are better suited to defining whether ΔENaC traffics to the plasma membrane, we examined surface expression of ΔENaC and FL-ENaC expressed in GnTI- HEK cells using confocal microscopy. To ensure robust expression, we transduced the HEK cells with baculovirus encoding the ΔENaC and FL-ENaC proteins, taking advantage of the N-terminal eGFP in the Δγ subunit and the N-terminal eGFP in all three FL subunits to visualize expression, respectively. Based on eGFP fluorescence, we observed robust expression of both ΔENaC and FL-ENaC (Figure 2—figure supplement 2c,d). We employed tetramethylrhodamine (TRITC)-labeled 10D4 mAb, an antibody that binds to the extracellular domain of ENaC, to probe the plasma membrane localization of ENaC channels. Indeed, we observed overlapping signals from both eGFP and TRITC-10D4 mAb in cells expressing FL-ENaC but not in cells expressing ΔENaC. Based on the confocal imaging results, ΔENaC is not trafficked to the plasma membrane, in agreement with the electrophysiology results in HEK 293S GnTI- cells and oocytes (Figure 2—figure supplement 2). Functional characterization of ∆ENaC by TEVC. (a) Representative current trace of FL-ENaC shows selectivity of Na+ over K+, block by amiloride and sensitivity to trypsin treatment (2.5 µg/mL for 5 min) by a 2.22 ± 0.49 fold increase in steady state currents post-trypsin treatment (n = 3). The cartoon located on the right side of each current trace represents the combination of subunits injected in the oocytes. Filled circles represent FL-ENaC subunits while open represent the ∆ENaC subunits. Dotted lines represent ENaC subunits that contain the intact protease sites. (b–f) Representative current traces of Δα-FLβγ (b), Δα*-FLβγ (c), Δβ-FLαγ (d), Δγ-FLαβ (e) and Δγ*-FLαβ (f) demonstrate that the ∆ENaC subunits can form a functional channel with two FL-ENaC subunits that are selective for Na+ over K+ and sensitive to amiloride and trypsin treatment. Currents after trypsin treament increased by 5.15 ± 1.13 (b), 4.42 ± 0.61 (c), 1.46 ± 0.1 (d), 9.52 ± 2.88 (e) and 13.26 ± 5.67 (f) fold (n = 3 for all combinations). We further examined whether disruption of the channel by mutagenesis also caused the absence of ΔENaC current. We tested channels comprising a single Δ or Δ* subunit in complex with the two complementary FL-ENaC subunits. 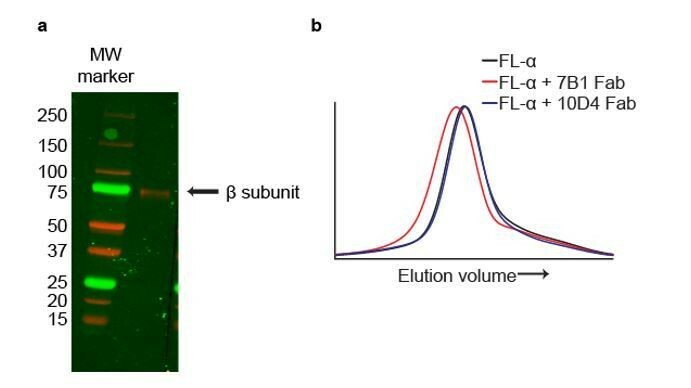 Channels comprising Δα-FLβ-FLγ conduct amiloride-sensitive Na+ currents which increase approximately 5-fold upon trypsin treatment (compared with 2.2-fold for FL-ENaC, Figure 2b, Figure 2—figure supplements 2 and 3, and Figure 2—source data 1). Since this trypsin response could be a result of cleavage of FLγ, we also tested channels of Δα*-FLβ-FLγ (Figure 2c). These channels show an increase in total current compared to Δα-FLβ-FLγ, and demonstrate a more archetypal ENaC current trace (Figure 2a, Figure 2—figure supplement 3, Figure 2—source data 1). These results, in addition to the cleavage pattern of an anti-α immunoblot (Figure 2—figure supplement 4) indicate that Δα adopts a biologically relevant fold, capable of forming active channels with other full-length subunits, and that it is likely cleaved once at its N-terminal furin site (RSRA in Δα) but not the C-terminal furin site (AAAA in Δα, Figure 1—figure supplement 1). By restoring the protease sites, as in Δα*, the inhibitory peptide was effectively removed. The FLα-Δβ-FLγ channels conducted amiloride-sensitive Na+ currents with a post-trypsin/pre-trypsin ratio of 1.5 (Figure 2d, Figure 2—figure supplement 3, Figure 2—source data 1), similar to that of FL-ENaC. Moreover, an anti-β immunoblot shows no cleavage of Δβ, as expected (Figure 2—figure supplement 5).The FLα-FLβ-Δγ channel also conduct an amiloride-sensitive Na+ current with approximately 9.5-fold increase upon trypsin treatment (Figure 2e, Figure 2—figure supplements 2 and 3, and Figure 2—source data 1). Although the Δγ subunit has the canonical furin and prostasin sites mutated (AAAA and QQQQ respectively, Figure 1—figure supplement 1), there are other basic residues near the furin and prostasin sites that could be cleaved by trypsin. This hypothesis is further supported by the immunoblot showing significant trypsin digestion in Δγ (Figure 2—figure supplement 6) as well as the even higher trypsin activation of FLα-FLβ-Δγ* (approximately 13.3-fold, Figure 2f and Figure 2—figure supplement 3 and Figure 2—source data 1). Nevertheless, the results are a promising direction for future studies. Importantly, the combination of TEVC traces of each Δ subunit and the α and γ Δ* counterparts supports ΔENaC representing a biologically relevant channel. We solved the structure of ΔENaC diFab complex in n-Dodecyl β-D-maltoside (DDM) by cryoEM (Figure 3, Figure 3—source data 1). We first carried out cycles of 2D and 3D classifications to remove ice contamination, micelles, and denatured complexes. The remaining particles were subjected to unsupervised ab initio 3D classification and refinement in cryoSPARC (Punjani et al., 2017) as well as 3D classification and refinement in cisTEM (Grant et al., 2018) to arrive at the cryo-EM potential map with a nominal resolution of 4.2 Å from both programs, based on the gold standard FSC = 0.143 and solvent adjusted FSC = 0.143 criteria, respectively (Figure 3—figure supplement 1). Additionally, we conducted a masked refinement excluding the flexible Fc domains of the Fabs and micelle in cisTEM (Figure 3a), and obtained a map at 3.9 Å, as determined by the solvent adjusted FSC = 0.143 criterion (Figure 3b,c), with local resolution estimates generated by BSoft (Heymann and Belnap, 2007) indicating regions of the map with a resolution of 3.7 Å (Figure 3d). Cryo-EM analysis of final 3D reconstruction map. (a) Outline of mask used in the final 3D refinement of ΔENaC-7B1/10D4 complex. (b) Angular distribution of particle projections of the ΔENaC-7B1/10D4 complex. (c) Solvent adjusted FSC curve (purple) by cisTEM along with FSC curve between the atomic model of ΔENaC-7B1/10D4 complex and half map 1 (Rfree – dark grey), half map 2 (Rwork – light grey) and final reconstruction map (Rsum – black). The solid line indicates FSC = 0.143. (d) 3D map colored according to local resolution estimation using Bsoft. Blue indicates regions where local resolution is estimated to be ~ 3.7 Å. The cryo-EM potential map has three major regions into which the two Fabs and homology models of ΔENaC were manually fitted (Figure 4). Alignment of predicted glycosylation sites and aromatic residues to distinct features in the map allowed for the correct assignment of the homology models of the ENaC ECD, generated from the desensitized state of ASIC (PDB: 2QTS, Figure 4—figure supplements 1–5, Figure 4—video 1). The β subunit is predicted to have 11 glycosylation sites by primary sequence, considerably more than α or γ. Six prominent glycosylation sites were used to assign β (as opposed to the three each in α and γ), whereas a glycosylation on the β9-α4 loop distinguished α from γ (Figure 1—figure supplement 2, Figure 4—figure supplement 1). Guided by these features and the 10D4 monoFab ΔENaC map, we assigned the identity of 7B1 and 10D4 as binding α and β subunits, respectively (Figure 4, Figure 1—figure supplement 4). Architecture of the human epithelial sodium channel. (a) and (b), Cryo-EM map of the ΔENaC-7B1/10D4 complex viewed parallel (a) and perpendicular (b) to the membrane. The α, β, and γ subunits are colored blue, red, and magenta, respectively. The 7B1 and 10D4 Fv densities are colored green and wheat, respectively. (c) and (d), Cartoon representation of the ΔENaC-7B1/10D4 complex viewed and colored as in (a) and (b). The dimensions of the complex and ΔENaC alone are indicated. The centers of mass of the Fv’s make 154° angle. Forming a trimeric ensemble, the α-β-γ subunits arrange in a counterclockwise manner, as reported by previous studies (Collier and Snyder, 2011; Collier et al., 2014; Chen et al., 2011) (Figure 4b,d). The overall domain organization within each subunit of ΔENaC concurs with that of ASIC, which was first illustrated in the crystal structure of chicken ASIC (cASIC) (Jasti et al., 2007) (chicken ASIC shares 18 – 20% sequence identity with human ENaC; Figure 5, Figure 5—figure supplement 1). Each subunit of ΔENaC harbors a cysteine-rich ECD resembling a hand with the palm, knuckle, finger, and thumb domains clenching a ‘ball’ of β strands. This compact organization is stabilized by eight disulfide bridges in the ECDs of α and γ and nine in β. Seven of the disulfide bonds are conserved throughout the ENaC/DEG family (Figure 1—figure supplement 1, Figure 1—figure supplement 2, Figure 5a–c). The eighth is unique to the three ENaC subunits. For the purpose of consistency in the following discussion, domain and secondary structure assignment in ENaC follow those of ASIC (Figure 5d). Domain organization in each subunit of ΔENaC resembles a hand clenching a ball. (a–c) Domain organization of each ENaC subunit and locations of disulfide bridges. 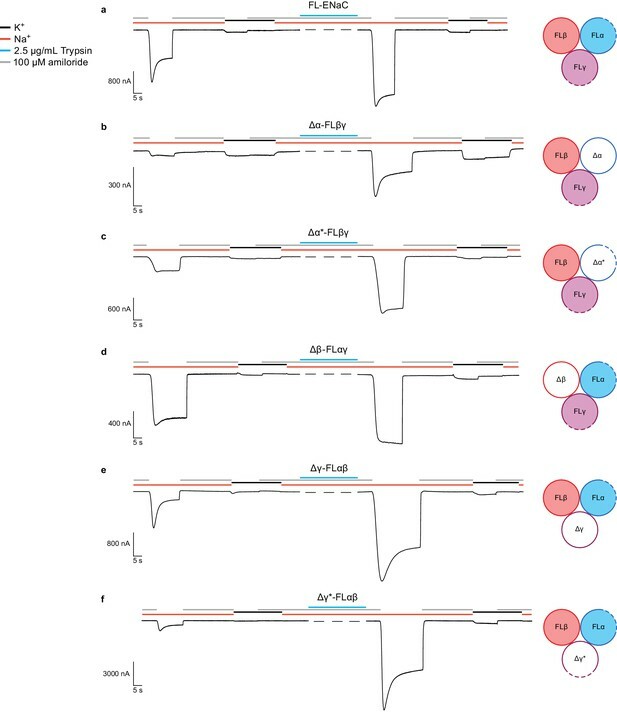 Disulfide bridges 1–7 are conserved across ENaC/DEG family while the eighth disulfide bridge is shared by α (a), β (b), and γ (c) and located in the GRIP domain (P1 - P4). The β subunit contains a ninth disulfide bridge that is also located in the GRIP domain. All subunits are in cartoon representation and colored as in Figure 4 and the disulfide bridges are in sticks representation. (d) Schematic diagram of secondary structure elements of ENaC subunits colored as follows: knuckle, cyan; palm, yellow; finger, purple; GRIP, blue; β-ball, orange; thumb, green. At the center of the trimeric architecture of the ECD are β-sheets formed by β1, β3, β6, and β9-β12 that constitute the palm domain, which are divided into two sections, the upper and lower palm domains. The upper palm domain cradles the β-ball, which is composed of β2, β4, β5, β7, and β8 in all three subunits, contrary to previous findings which suggested that the α subunit lacked the β4 and β5 strands (Stockand et al., 2008). Completing the ‘clench’ around the β-ball are the α1 – 3 of the finger, α4 – 5 of the thumb, and α6 of the knuckle domains. The lower palm is directly linked to the transmembrane domain (TMD) via β1 and β12 and to the α4 and α5 of the thumb through β9 and β10. The thumb and the lower palm converge to forge interactions with the TMD at a juncture called the ‘wrist’ (Figure 5—figure supplement 1). Underscoring the importance of the wrist region and the critical roles that disulfide bridges play in maintaining the structural and functional integrity of ENaC, alterations of a conserved cysteine, α-Cys479 to an Arg, causes Liddle syndrome due to a missense mutation that not only eliminates a disulfide bridge located at the juncture of the thumb and palm domains but also introduces a bulky, positively charged residue (Salih et al., 2017) (Figure 5a). ENaC differs significantly from ASIC in both structure and primary sequence at the knuckle and finger domains (Figure 1—figure supplement 1, Figure 1—figure supplement 2, Figure 5—figure supplement 1). Each knuckle domain in ENaC makes extensive interactions with the α1 and α2 helices of the finger domain in the adjacent subunit (Figure 6). Together, the knuckle and finger domains of all three subunits form a ‘collar’ at the top of the ECD. Sequence alignment of the three subunits demonstrate divergence in amino acid sequence at the C-terminal end of both α1 and α6 in all three subunits, which results in distinct types of molecular interactions at each subunit interface that are, perhaps, associated with assembly and stability of the ENaC. The contact between the finger and thumb domains is mediated by long antiparallel helices α1 and α2, which form a barrier between the thumb domain and the β6-β7 loop with α2 making the primary contacts with the thumb domain (Figure 5—figure supplement 1, Figure 6). The domain arrangement observed in the ΔENaC structure agrees with the functional study probing Na+ binding sites in the α subunit of ENaC (Kashlan et al., 2015). The α2 helix makes an almost 90° turn towards the palm domain breaking the helix. This architecture marks another departure from ASIC, in which contacts between the finger and thumb domains are largely mediated by α1, α3, α5, and the α4-α5 loop (Figure 5—figure supplement 1). Intersubunit interactions in ΔENaC in the finger and knuckle domains. (a) The finger and knuckle domains forge intersubunit interactions forming a ‘collar’ at the top of the ECD. Surface representation of ΔENaC viewed perpendicular to the membrane. Subunits are colored as in Figure 4. The finger (α1 – 3) and knuckle domains (α6) are shown in cartoon representation. (b–d), Detailed view of the interfaces boxed in (a). The views are parallel to the membrane and show how the helices from the finger and knuckle domains constitute an enclosure around the β6-β7 loop. The TMD is not well ordered, hampering our ability to model the entire TMD region and assign a functional state of the channel. Nevertheless, the EM map offers a glimpse of the positions of TM1 and TM2 on the extracellular side from each subunit (Figure 6—figure supplement 1). The overall configuration of the TMD shows that TM2 of all three subunits are positioned near the central axis, poised to mediate ion conduction in agreement with the crystal structures of ASIC and previous elegant functional studies probing ion selectivity and channel block (Kellenberger and Schild, 2002). Strikingly, the potential map for γ-TM1 on the extracellular side illustrates clear map for the main chain preceding the β1 strand validating a sequence disparity between the γ subunit and the other ENaC and ASIC subunits (Figure 6—figure supplement 1). The γ subunit lacks two residues preceding the palm domain (Figure 6—figure supplement 1f). Consequently, interactions within the wrist region in the γ subunit may differ from that of α and β subunits. Previous studies of ENaC have probed stretches of amino acids and their roles in ENaC function by perturbing known protease sites, observing changes in molecular weight, recording channel activity, and conducting cross-linking studies (Bruns et al., 2007; Carattino et al., 2006). The structure of ΔENaC indicates that these stretches of 20 – 40 amino acids are pieces of larger domains located in the periphery of the ECD near subunit interfaces (Figure 7). These stretches of amino acids, located between α1 and α2 are unique to ENaC and are responsible for channel Gating Relief of Inhibition by Proteolysis and will hereafter be referred to as the GRIP domain. Each GRIP domain is composed of a core of β strands that forge interactions with the finger and thumb domains forming a β-sheet ‘blanket’ that conceals the α2 helix of the finger (Figure 7—figure supplement 1). Surprisingly, although the β subunit is not known to gate the channel via proteolysis, it also possesses a GRIP domain with similar organization to those of the α and γ subunits. The protease-sensitive domain in ENaC is part of the GRIP domain. (a) ΔENaC is shown in cartoon representation and colored as in Figure 4. The GRIP domain is shown in surface representation. Close-up view of the cleft formed by the finger and thumb domains and the P3-P4 segments in α (b), β (c), and γ (d). The cleft is occupied by the P1 segment of the GRIP domain. All three subunits contain conserved tryptophans in α2 (αTrp251, βTrp218, and γTrp229), which interacts with the P1 segment. The P3 and P4 strands are stabilized by the α5 of the thumb domain by docking on top of aromatic residues (αTyr455, βHis425, and γTyr433). In all three subunits, the GRIP domains comprise two antiparallel β strands stapled together by a disulfide bond located in the loop that rests against the thumb domain (Figure 7b–d, Figure 7—figure supplement 1b–d). Furthermore, an additional disulfide bond in the loop near the β-γ interface stabilizes the GRIP domain of the β subunit. We suspect that this additional disulfide bond contributes to the well-ordered behavior of the β GRIP domain, allowing the resolution of nearly the whole segment between α1 and α2 in the β subunit. Moreover, the 10D4 Fab binds the β GRIP domain, allowing us to resolve two additional antiparallel β strands. In the α and γ subunits, we can only identify one stretch of residues that adopt an extended conformation. Based on the shared features observed in all three subunits, it is plausible that the α and γ subunits also contain a fourth β strand. With four possible β strands in the GRIP domains, each strand or stretch of peptides is referred to here as P1-4 (Figure 7). Structural insight gleaned from the β GRIP domain reveals the possible positions of the functionally well-characterized but structurally elusive inhibitory tracts and furin and other protease sites in the α and γ GRIP domains. Studies by the Kleyman group have identified 8- and 11-mer peptide tracts within the α and γ GRIP domains, respectively, which are implicated in channel gating (Passero et al., 2010; Carattino et al., 2008b; Kashlan et al., 2010). Sequence comparison between the three subunits suggests that the inhibitory tracts contain the P1 strand (Figure 7b – d, Figure 7—figure supplement 1b–d, Figure 1—figure supplement 1). Based on this configuration, the first furin site lies at the N-terminal side of P1 whereas the second protease site (furin for α and other protease sites for γ) is likely located at the C-terminal side of P2. The anti-parallel organization of P1 and P2 strands places the two protease sites in close proximity to each other. We speculate that this arrangement allows for efficient proteolysis, especially for the cleavage of the α subunit by furin. The first crystal structure of ASIC identified the finger and the thumb domains as major players in ion channel gating. Rearrangements of these domains are coupled to the TMD via the wrist. Additionally, the crystal structure provided insight into the domain essential for fine-tuning ASIC pH-response, deemed the acidic pocket, formed by the β-ball, finger, and thumb domains of one subunit, and the palm domain of the adjacent subunit (Vullo et al., 2017). While the acidic pockets in ASIC are lined with negatively charged residues, the equivalent crevices in ENaC are replete with aromatic residues. In fact, aside from Ser428 of Δβ (Asp346 in ASIC), the equivalent sites in the thumb domain that are acidic in ASIC are occupied by tyrosines in all three subunits (Figure 8, Figure 1—figure supplement 1, Figure 1—figure supplement 2) (Jasti et al., 2007). Accordingly, the pocket that is largely occupied by α2 in ΔENaC is referred to here as the aromatic pocket. 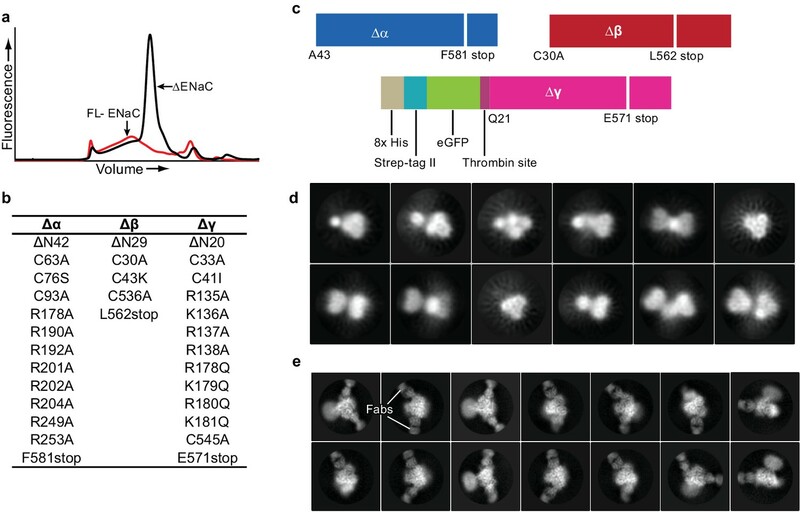 The α2 helix is buried in the aromatic pocket formed by key gating domains in ENaC. The aromatic pockets at the α-β (a), β-γ (b), and γ-α (c) interfaces are shown in cartoon representation. The aromatic residues are shown in sticks representation. Residues conserved in ASIC are colored green. The α2 helices and the GRIP domains are omitted for clarity. The position of the α2 is shown as dotted circles. Tucked in the aromatic pocket, α2 makes contacts with all critical elements of the gating machinery in ENaC. This observation is consistent with studies finding that site-directed mutagenesis perturbing residues in the α2 results in changes in Na+ self-inhibition and binding of the P1 segment of the GRIP domain (Kashlan et al., 2010). In all three ENaC subunits, the α2 forms contacts with the thumb, α1 helix, the β6-β7 loop and the GRIP domain, and with the knuckle and the upper palm domains in the adjacent subunit (Figure 8). Moreover, studies using synthesized 8-mer (LPHPLQRL) and 11-mer peptides (RFLNLIPLLVF) (Passero et al., 2010), the inhibitory peptides of α and γ subunits, respectively, have identified residues in α2 to be critical to the binding of the inhibitory peptides. These peptides pack against α2 and form a wedge between the thumb domain and α1 in the ΔENaC structure (Figure 7b–d and Figure 7—figure supplement 1b–d). These inhibitory peptides contain prolines that introduce a kink within the tract that may serve as a point that divides P1 into two segments: the N-terminal side, which interacts with the finger and thumb; and the C-terminal side, which interacts primarily with α2 and P3. The observed orientation of the P1 segment is consistent with the cross-linking experiments by Kashlan et al., which provided two major findings: (1) the inhibitory tracts adopt an extended conformation and ﻿(2) the N-terminal side of the peptide binds near the thumb/finger interface (Kashlan et al., 2010; Kashlan et al., 2012). The potential map for α-P1 suggests that the N-terminal side mirrors that of β-P1 forging contacts with the α1 helix (Figure 7—figure supplement 1b,c). In contrast, the potential map for the γ-P1 suggests that the peptide interacts with the thumb and α1/α2 more extensively and extends toward α3 (Figure 7—figure supplement 1d). These distinct points of contact with the finger and thumb domains between the α- and γ-P1 segments may influence the extent to which the subunits influence channel Po. While removal of the inhibitory tract in α transitions the channel to an intermediate Po state, excision of the γ-P1 segment places the channel in the high Po state; this high Po state can be accomplished without the removal of the α-P1 (Carattino et al., 2008a). 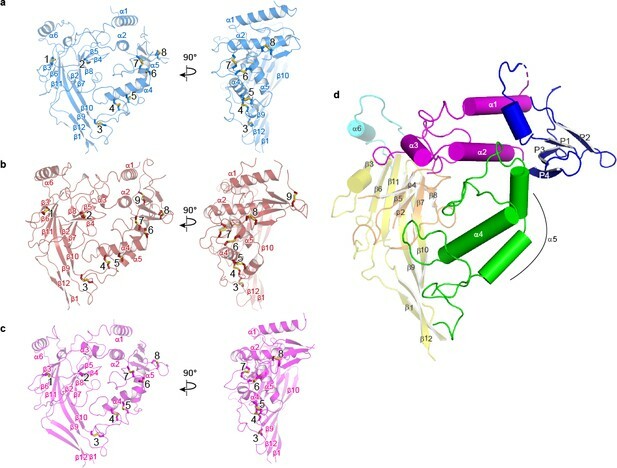 The visual evidence of direct interactions between P1 and the finger and thumb domains demonstrated in the ΔENaC structure sheds light into how these inhibitory tracts can modulate channel function in ENaC. ΔENaC follows a common organization that was first observed in ASICs: a scaffolding structure in the upper palm, the flexible lower palm which is tethered to the TM and thumb, and the β-ball (Figure 5—figure supplement 1) (Jasti et al., 2007). However, the specialized finger domains deviate from what is observed in ASIC and such deviations accommodate the distinct functions between the proton sensors of ASIC and the protease-sensitive regulators of ENaC. Key gating structures are preserved, albeit with specific structural configurations in both ASIC and ENaC supporting the idea that the superfamily of ENaC/DEG channels conform to a gating scheme that involves conformational changes of the finger and thumb domains, rearrangements that are propagated to the ion channel via the wrist (Jasti et al., 2007). In the case for ENaC, a speculative model for gating involves proteolysis and the subsequent removal of the P1 segment, which serves as a wedge, inducing rearrangements of the finger and thumb domains (Figure 9). Mechanism of protease-dependent gating in a single ENaC subunit. Removal of the protease sensitive segments of the GRIP domain (a) induces conformational changes in the finger and thumb domains (b), which is perhaps coupled to ion channel gating through the wrist. The structural work presented here provides new insight into ENaC assembly and gating. The structure unveils the positions of the GRIP domains, specifically the key peptidyl tracts that inhibit ENaC activity, and the distinct interactions that they mediate with the finger and thumb domains. Furthermore, it reveals that there are different interactions between the finger and knuckle domains at each subunit interface, and between the base of the thumb and the TMD in the wrist region suggesting that each subunit differentially contributes toward gating the channel, supporting electrophysiological findings. Importantly, the structure provides the first molecular model for protease-dependent regulation of ENaC opening and Na+ and water homeostasis. 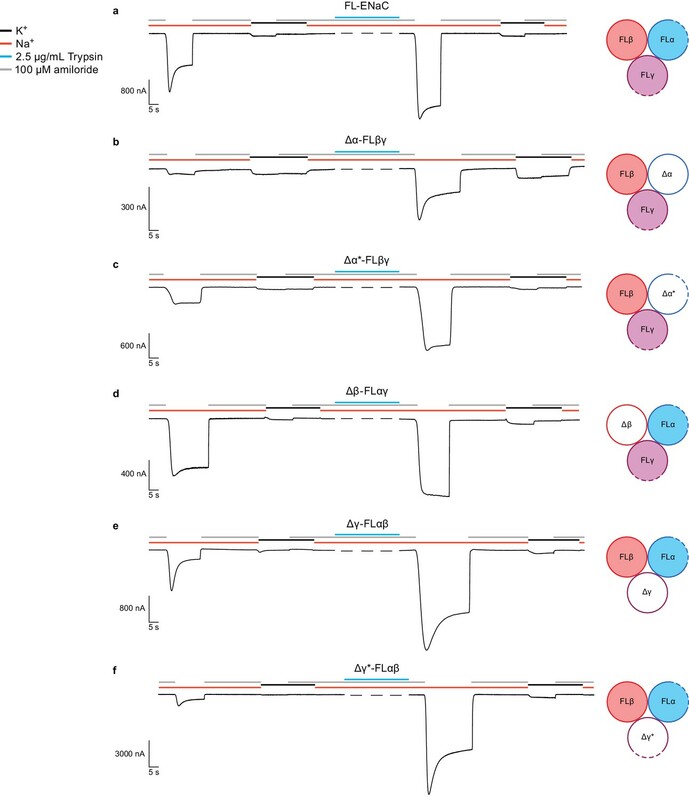 The cDNA encoding the full length α, β and γ subunits of human ENaC were cloned into pEG BacMam expression vector harboring an N-terminal eGFP (Goehring et al., 2014). The Δα was generated by removing both N- and C-terminal segments and modifying the furin sites obtaining a mutant variant of the α subunit lacking 42 and 89 residues at N- and C- termini, respectively. While the Δβ was designed to possess truncations of 30 and 79 residues at the N- and C-terminal regions, ΔβASIC has the same truncated regions as Δβ but contains an additional N-terminal 2 – 22 residues of cASIC upstream of Δβ. Lastly, Δγ lacks 20 and 79 residues at the N- and C-terminal domains, has modified furin and prostasin sites, and includes a Strep-tag II, an octa-histidine tag, eGFP, and Thrombin cleavage site at the N-terminus. Mouse monoclonal antibodies 7B1 and 10D4 were generated using standard procedure by Dan Cawley at the Vaccine and Gene Therapy Institute (OHSU). Liposomes containing asolectin:cholesterol:lipidA:brain polar lipid extract (BPLE) (16:4.6:1:5.3) were prepared in 20 mM Tris, 150 mM NaCl at pH 8.0 at a concentration of 40 mg/ml. The mixture was subjected to repeated freeze-thaw cycles followed by extrusion through a 200-nm filter. Purified ΔENaCASIC (Δα, ΔβASIC, Δγ) protein was added to the liposome mixture in the presence of 400 mM NaCl and 0.8% Na-cholate and passed through a PD-10 desalting column to remove excess salt and detergent. Mice were immunized with approximately 30 μg of the reconstituted ΔENaCASIC for generation of hybdridoma cell lines (Figure 1—figure supplement 3). Monoclonal antibodies were screened by FSEC and BioDot blot to identify clones that recognize tertiary or primary epitopes. The 7B1 and 10D4 mAbs were selected because they recognize tertiary epitopes of ENaC. The mAbs were purified, and their Fabs were generated by papain cleavage. Fab 7B1 was isolated by anion exchange using HiTrap Q HP column while Fab 10D4 was eluted using Protein A column to remove Fc. After isolation, both Fabs were dialyzed in 200 mM NaCl and 20 mM Tris at pH 8.0. Human embryonic kidney cells lacking N-acetylglucosaminyltransferase I (HEK293S GnTI- cells) were grown in suspension at a density of 2−4 × 106 cells / ml in Freestyle medium with 2% FBS and transduced with the virus (Δα, Δβ and Δγ) at a multiplicity of infection (MOI) of 1 and incubated at 37°C. Eight hours post-transduction, sodium butyrate and phenamil mesylate were added to 10 mM and 500 nM, respectively, and cells were incubated at 30°C. After 36 hr, the cells were collected by centrifugation at 4790 xg for 15 min. The pellet was washed with 20 mM Tris, 200 mM NaCl and followed by a second round of centrifugation at 4790 xg for 15 min. Cells were homogenized with a dounce homogenizer and sonicated in 20 mM Tris, 200 mM NaCl, 5 mM MgCl2, 25 μg/ml DNase I and protease inhibitors. Lysed cells were centrifuged at 9715 xg for 20 min; the resulting supernatant containing the membrane fraction was further centrifuged at 100,000 xg for 1 hr. Membrane pellets were resuspended and solubilized in 20 mM TRIS pH 8, 200 mM NaCl, 20 mM n-dodecyl-β-D-maltopyranoside (DDM, Anatrace), 3 mM cholesteryl hemisuccinate (CHS), 2 mM ATP, 2 mM MgSO4, protease inhibitor and 25 U/mL nuclease for 1 hr at 4°C. The solubilized fraction was isolated by ultracentrifugation 100,000 xg for 1 hr, and ΔENaC was bound to streptactin resin packed into an XK-16 column. The column was washed with 20 mM TRIS, 200 mM NaCl, 0.5 mM DDM, 75 μM CHS and 25 U/mL nuclease, followed by an additional wash of the same buffer containing 2 mM ATP, and eluted with 2.5 mM desthiobiotin. The eluted fractions were concentrated and then incubated with either one Fab 10D4 (monoFab complex) or two Fabs 7B1 and 10D4 (diFab complex) in a 1:3 molar ratio of ENaC:Fab for 10 min, and clarified by ultracentrifugation 100,000 xg for 1 hr. The supernatant was injected onto a Superose 6 Increase 10/300 GL column equilibrated in 20 mM TRIS pH 8.0, 200 mM NaCl, 0.5 mM DDM, 75 µM CHS and 1 mM TCEP to isolate the protein complex by size-exclusion chromatography. Monodispersed fractions were pooled and concentrated to 2.2 mg/mL. For FSEC experiments analyzing peak shifts of the ΔENaC and FL-ENaC with 7B1 and 10D4, ΔENaC was expressed in HEK 293S GnTI-, as described above, while FL-ENaC was expressed in HEK 293T/17. The HEK 293T/17 cells were grown in suspension at a density of 2−4 × 106 cells / ml in Freestyle medium with 2% FBS and transduced with the virus (FL-α, FL-β and FL-γ) at a multiplicity of infection (MOI) of 1 and incubated at 37°C. Eight hours post-transduction, 500 nM phenamil mesylate was added, and cells were incubated at 30°C. After 36 hr post-transduction, the cells were collected by centrifugation at 4790 xg for 15 min. The pellet was washed with 20 mM Tris, 200 mM NaCl and followed by a second round of centrifugation at 4790 xg for 15 min. Cell pellets were resuspended and solubilized in 20 mM TRIS pH 8, 200 mM NaCl, 20 mM n-dodecyl-β-D-maltopyranoside (DDM, Anatrace), 3 mM cholesteryl hemisuccinate (CHS), protease inhibitor and 25 U/mL nuclease for 1 hr at 4°C. The solubilized fraction was isolated by ultracentrifugation 100,000 xg for 1 hr, then incubated with either one Fab (7B1 or 10D4) or two Fabs (7B1/10D4) in a 1:3 molar ratio of ENaC:Fab for 10 min, and clarified by ultracentrifugation 100,000 xg for 1 hr. The supernatant was injected onto a Superose 6 Increase 10/300 GL column for FSEC analysis. Aliquots of 7 µg purified ENaC were incubated with 2.5 µg/mL trypsin for 10 min at room temperature. These samples were then run through 4 – 20% Criterion SDS-PAGE gels and blotted onto nitrocellulose membranes according to manufacturer’s instructions (Bio-Rad). After blocking overnight in 5% non-fat milk in TBS, membranes were incubated in primary antibody (ENaC α subunit, 6 µg/blot SC-21012; ENaC β subunit, 6 µg/blot SC-21013; ENaC γ subunit, 10 µg/blot abcam ab133430) for 2 hr. The membranes were then incubated in 1 µg/blot IRDye 800CW goat anti-rabbit IgG (Licor) for 1 hr. Purified ΔENaC-Fab complexes were applied to glow-discharged Quantifoil holey carbon grids (Au 1.2 µm/1.3 µm hole space/hole separation, 300mesh), blotted using a Vitrobot Mark III (FEI) with the following conditions, 7 s wait time, and 5 s blot time at 100% humidity, and then plunge-frozen in liquid ethane cooled by liquid nitrogen. All images were collected on a Titan Krios electron microscope operating at 300 kV at the Multiscale Microscopy Core (OHSU). Images were recorded by a Gatan K2 Summit direct electron detector operating in super-resolution mode, and the images were collected using the automated acquisition program SerialEM (Mastronade, 2003). Magnification of the recorded images corresponded to a pixel size of 1.33 Å in counting mode (0.665 Å in super-resolution mode). For the ∆ENaC-10D4 complex, two data sets were acquired and were initially processed separately, and subsequently combined for 3D reconstruction. Each image in the first dataset was dose-fractionated to 30 frames with 0.5 s per frame and a total exposure time and dose of 15 s and 54 e-/Å2, respectively. The second dataset was collected in counting mode, and was therefore not binned when combined with the first where each image was dose-fractionated to 60 frames with 0.25 s per frame and a total exposure time and dose of 15 s and 50 e-/Å2, respectively. Similarly, two separate datasets were obtained for ∆ENaC-7B1/10D4 complex in super-resolution mode. Like in the monoFab complex, each data set was processed separately and later combined for further analysis and 3D reconstruction. 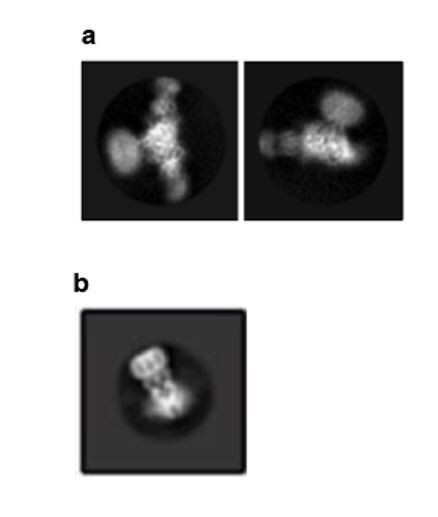 The images of the first dataset of the diFab complex were dose-fractionated to 40 frames with 0.25 s per frame and a total exposure time and dose of 10 s and 62 e-/Å2, respectively, while the images of the second dataset were dose-fractionated to 48 frames with 0.25 s per frame and a total exposure time and dose of 12 s and 71 e-/Å2, respectively. The ∆ENaC-10D4 data set collected in super-resolution mode was binned 2 × 2 while the ∆ENaC-10D4 data set collected in counting mode was left unbinned. Both data sets were motion corrected using MotionCor2 (Zheng et al., 2017), and automated particle selection was performed using DoGPicker (Voss et al., 2009). Defocus values for individual particles were estimated using Gctf (Zhang, 2016), and particles belonging to low-abundance classes were removed via 2D classification and 3D classification in RELION (Scheres, 2012). The final set of particles was further analyzed in cryoSPARC and refined to a nominal resolution of 5.4 Å (Punjani et al., 2017). For the ∆ENaC-7B1/10D4 data sets, super-resolution counting images were 2 × 2 binned, and motion corrected using MotionCor2. Manual and automated particle selections were performed where DoGPicker was utilized for the latter resulting in a total of 667,984 particles. Defocus values for individual particles were estimated using Gctf, and particles of low-abundance classes via 2D classification in RELION were removed. For 3D classification in RELION, a reference model of a low-resolution map of ENaC-7B1/10D4 obtained from a data set (14.4 Å) was low-pass filtered to 50 Å, and particles were classified into two classes where the major class contained 385,997 particles. Duplicates (as a result of RELION2.0 re-centering particles after 2D classification) and particles close to micrograph edges were removed, resulting in 329,180 particles that were subjected to ab initio 3D classification in cryoSPARC (Punjani et al., 2017), and 3D classification and refinement in cisTEM (Grant et al., 2018). Particles belonging to the low abundance class in cryoSPARC and cisTEM were discarded yielding 244,223 and 290,007 particles, respectively. Using default settings in cryoSPARC, particles with class probability of > 0.9 were used for refinement; thus, final reconstruction and refinement used 244,223 particles. For cisTEM, initial 3D classification and refinement was done using a refinement threshold of 8 Å and applying a mask during the last few iterations that excluded the constant domain (Fc) of the Fabs. During this process, we noticed that extraneous features, such as the micelle, were having a strong influence on alignment and classification, so the cisTEM particles were then re-processed using a mask that excluded both the micelle and the Fc of the Fabs, and aligned with a 5.4 Å limit. This dataset consisted of 302,263 particles and improved the resolution, as determined by the FSC = 0.143 criterion (~3.9 Å). More importantly, the electrostatic potential map was notably improved in the regions of interest. The resolutions reported in Figure 3—source data 1 are based on the FSC = 0.143 criterion (gold-standard in the case of RELION and cryoSPARC). Final resolution reported in Figure 3—source data 1 are solvent adjusted FSC = 0.143 criterion. No symmetry was applied during data processing. Homology models of the human α, β, and γ subunits were generated with the crystal structure of cASIC (Jasti et al., 2007) (PDB code: 2QTS, chain A) as a template using SWISS-MODEL server and homology models for the Fabs were also generated by SWISS-MODEL (Arnold et al., 2006). All models were docked into the EM potential in UCSF Chimera then rigid-body fitted into the EM potential using Coot (Pettersen et al., 2004; Emsley and Cowtan, 2004). We incorporated models generated from Rosetta (DiMaio et al., 2011) into manual fitting and adjustments during model-building in Coot to build the palm, knuckle, TM, thumb, β-ball, and finger domains. To build the GRIP domains, we integrated analysis from Jpred4, PSIPRED v3.3, and QUARK online ab initio protein structure prediction to support our analysis of the cryo-EM map (Buchan et al., 2013; Xu and Zhang, 2012; Drozdetskiy et al., 2015). The final model was subjected to refinement using the module phenix.real_space_refine in PHENIX (Adams et al., 2011). 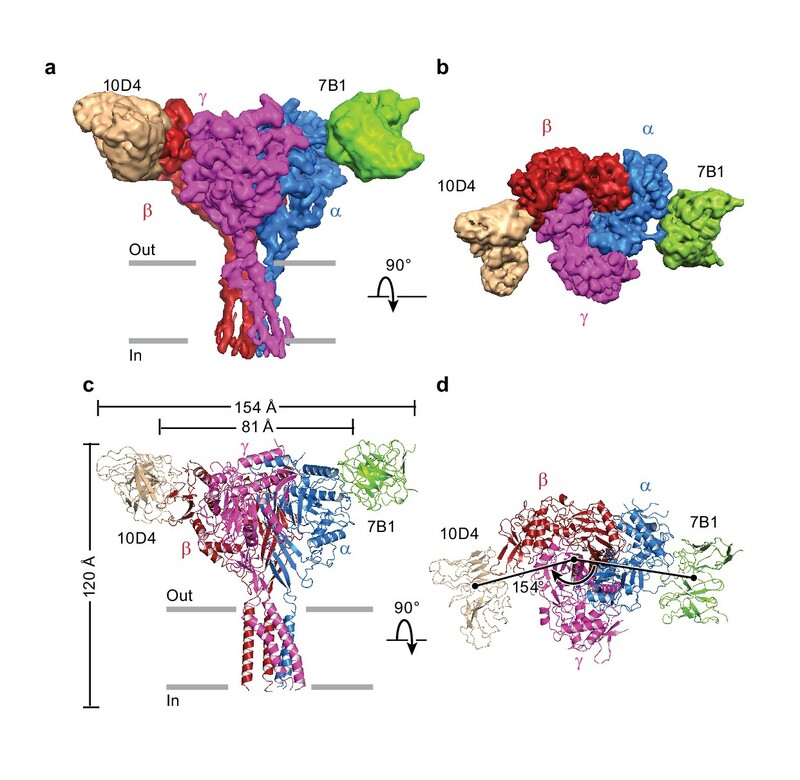 The cryo-EM map in all three subunits preceding the N-terminal side of the α2 helices was unambiguous and showed features consisting of two β-strands connected by a loop, the P3 and P4 segments of the GRIP domains (Figure 4—figure supplement 5). Secondary structure prediction analysis by online servers Jpred4, PSIPRED v3.3, and QUARK supported this observation (Buchan et al., 2013; Xu and Zhang, 2012; Drozdetskiy et al., 2015). We found that the potential map in the β subunit had the best-defined feature demonstrating four β strands (Figure 4—figure supplement 5). Based on the cryo-EM map, the P1 segments in α and γ adopt β strand-like conformations, like in the β subunit, which is also supported by the secondary structure prediction servers (Figure 4, Figure 4—figure supplement 5). The regions between P1 and P3 in the α and γ subunits, however, are disordered in the cryo-EM map. We built stretches of residues into the P1 potential maps in the α- and γ-GRIP domains using sequence alignment with the β-GRIP domain and cryo-EM potential map features as guides. For validation, FSC curves were calculated between the final model and the EM map as well as the two half maps generated by cisTEM. We implemented MolProbity to analyze geometries of the atomic model (Chen et al., 2010). All figures of map and atomic model were prepared using UCSF Chimera and Pymol (Pettersen et al., 2004). All constructs used for two-electrode voltage clamp electrophysiology (TEVC) experiments were cloned into pGEM vector, linearized and transcribed to mRNA using mMESSAGE mMACHINE T7 Ultra Kit (Ambion) procedure. Xenopus laevis oocytes purchased from Ecocyte were injected with a volume of 50 nL containing either 0.5 – 1.0 ng of each FL-ENaC subunit mRNA or 5 ng of each ∆ENaC and Δ*ENaC subunit mRNA. For experiments containing combinations of FL-ENaC and ∆ENaC, 5 ng of each subunit mRNA was injected. Oocytes were incubated at 16°C for 12 – 48 hr in the presence of 100 µM amiloride and 250 µg/mL amikacin. The recordings were performed using two different ionic solutions with or without 100 µM amiloride (110 mM KCl and 110 mM NaCl) where all buffers additionally contained 1.8 mM CaCl2 and 10 mM HEPES (pH 7.4). Macroscopic ENaC currents are defined as the difference between inwards currents obtained in the absence and in the presence of 100 μM amiloride. To test full activation of ∆ENaC constructs, 2.5 μg/mL Trypsin was perfused for 5 min in the presence of 100 µM amiloride. Amiloride-sensitive currents were recorded prior to Trypsin treatment as well as after in order to determine the increase in current amplitude. All recording experiments were carried out at a holding potential of −60 mV and repeated independently at least three times. HEK293S GnTI- cells were grown in suspension at a density of 2−4 × 106/ml in Freestyle medium with 2% FBS and transduced with the virus (Δα, Δβ, and Δγ; or FL-α, FL-β, and FL-γ) at a multiplicity of infection (MOI) of 1 and incubated in the presence of 500 nM phenamil mesylate at 30°C for 12 hr. Five hours before recording, cells were transferred to wells containing glass coverslips at a density of 0.3 – 0.5 × 106 cells/ml and in Dulbecco’s Modified Eagle Medium supplemented with 5% FBS and 500 nM phenamil mesylate. Whole-cell recordings were carried out 17 – 24 hr after transduction. Pipettes were pulled and polished to 2 – 2.5 MΩ resistance and filled with internal solution containing (in mM): 150 KCl, 2 MgCl2, 5 EGTA and 10 HEPES (pH 7.35). External solution contained (in mM): 150 NaCl, 2 MgCl2, 2 CaCl2, 10 HEPES (pH 7.4), and 0.1 amiloride. Test external solution did not contain 0.1 mM amiloride. As in TEVC experiments, macroscopic ENaC currents are defined as the difference between inwards currents obtained in the absence and in the presence of 100 μM amiloride. Holding potential was at −60 mV. Six mg of mAb 10D4 was dialyzed into 0.2 M carbonate-bicarbonate (Na2CO3/NaHCO3) solution buffered at pH 9.0. The dialyzed mAb was concentrated to 6 mg/mL. Tetramethylrhodamine (TRITC, ThermoFisher 46112) was dissolved in DMSO at a final concentration of 1 mg/mL. To the 10D4 solution, 35 μg of TRITC was slowly added and mixed thoroughly. The 10D4-TRITC mix was incubated at room temperature in the dark for 2 hr followed by gel filtration to remove excess TRITC. The carbonate-bicarbonate buffer was exchanged with Tris-buffered saline buffer (200 mM NaCl, 20 mM TRIS, pH 8.0) using PD-10 desalting column. The dye:protein molar ratio of the final TRITC-labeled mAb 10D4 in TBS buffer was approximately 2.8. HEK293S GNTI- cells were resuspended from DMEM into 2 mL HBSS media, stained with 10 µg (5 µg/μL stock) of WGA Alexa Fluor 647 conjugate (ThermoFisher W32466) and 170 µg (4.9 µg/μL stock) of 10D4-TRITC and subsequently incubated at 37°C for 10 min. The cells were then washed with PBS two times before resuspended in 1 mL HBSS. Live cell imaging was performed on a Yokogawa CSU-W1 spinning disk confocal microscope using a 60 × 1.4 Plan Apo VC objective. Images were acquired at a pixel size of 0.108 μm for three different wavelengths, starting at 640 nm, 561 nm and then 488 nm. Exposure time varied depending on sample intensity, but remained the same for each wavelength between the two samples of infected cells (FL-ENaC and ∆ENaC), 400 ms for 640 nm, 2 s for 561 nm and 600 ms for 488 nm. Images were imported into Fiji for image analysis. Journal of Biological Chemistry 282:6153–6160. Clinical and Experimental Pharmacology and Physiology, N/a-N/a 40:495–503. American Journal of Physiology. Cell Physiology 286:C190–C194. The Journal of Biological Chemistry 281:18901–18907. Journal of Biological Chemistry 283:25290–25295. American Journal of Physiology-Renal Physiology 294:F47–F52. The Journal of Biological Chemistry 286:27436–27446. The Journal of Biological Chemistry 286:6027–6032. The Journal of General Physiology 144:337–348. Pflügers Archiv European Journal of Physiology 416:612–614. Current Opinion in Nephrology and Hypertension 19:98–105. Journal of Structural Biology 157:3–18. The Journal of Biological Chemistry 278:37073–37082. Journal of Biological Chemistry 279:18111–18114. The Journal of Biological Chemistry 271:4725–4732. Journal of Biological Chemistry 285:35216–35223. The Journal of Biological Chemistry 287:20720–20726. The Journal of Biological Chemistry 290:568–576. New England Journal of Medicine 341:156–162. Journal of Biological Chemistry 284:20447–20451. The American Journal of Physiology 266:L728–L734. The American Journal of Physiology 239:F459–F465. American Journal of Physiology-Renal Physiology 299:F854–F861. Annual Review of Physiology 71:361–379. Journal of the American Society of Nephrology : JASN 28:3291–3299. Journal of Biological Chemistry 291:3682–3692. Journal of Biological Chemistry 285:30363–30369. Journal of the American Society of Nephrology : JASN 13:588–594. Journal of Structural Biology 166:205–213. The Journal of General Physiology 120:191–201. The Journal of Biological Chemistry 272:20975–20978. Thank you for submitting your article "Structure of the human epithelial sodium channel by cryo-electron microscopy" for consideration by eLife. Your article has been reviewed by three peer reviewers, and the evaluation has been overseen by Sriram Subramaniam as Reviewing Editor and Richard Aldrich as the Senior Editor. The following individual involved in review of your submission has agreed to reveal his identity: Lawrence Palmer (Reviewer #1). The reviewers are in general agreement that this is an important study that reports the first ENaC structure and provides a framework for future work on this protein. It also addresses a specific topic of interest in the field, namely the location of fragments cleaved from the α and γ subunits during proteolytic activation of the channel. Overall the work is impressive, but there are concerns that important gaps remain on technical and biological fronts. All three reviewers were concerned about the accuracy of the current model, particularly in the membrane-spanning regions, where no glycosylation sites can be used to guide the chain fitting. However, given the significance of the structure to this field, and the potential value of having structural findings available to biochemists and physiologists working on these channels, there was consensus that the authors should have an opportunity to submit a revised version. The authors should make an attempt to include in the revised version either additional mutagenesis data, or rigorous local comparisons of the model with the density, or perhaps better 3D classification, or at least address in some depth the limitations of the atomic model reported. 1) The TMD of the structure is poorly resolved, preventing analysis of the ion selectivity and permeation path in this region. The authors state that "The TMD is not very well ordered, hampering our ability to model the TMD and assign a functional state of the channel". However, in the Abstract the authors concluded that the reported structure was in a resting state. While this conclusion may be inferred from the functional study, this statement should be tempered or removed from the Abstract. On the other hand, the 2D class average result in Figure 1E suggests that the TMD is not disordered. Based on Figure 3——figure supplement 1, the final reconstruction is from about 250k particles, which is large enough for a further 3D classification. Another round of 3D classification with a local mask on the TMD may further improve the resolution of TMD. 2) Disease-related mutations should be discussed. Since gain or loss of function mutations of ENaC are associated with severe diseases, the study will be of more general interest if the authors provide some structure-based mechanistic analysis for at least some of the disease related mutations that can be mapped onto the structure. 3) Does the ΔENaC construct localize to the plasma membrane of the oocytes? It is possible that deletion of the N- and C-termini of all the subunits eliminates important trafficking signals and prevents the protein from reaching the surface. On the other hand, if the protein does get to the surface it suggests that the structure is of a closed state of the channel. This would be nice to know. 4) The use of glycosylation sites to disambiguate the subunits in the cryo-EM map is sensible, and seems well done. However, given the modest resolution of some of these residues in the map, did the authors use an orthogonal approach to disambiguate the subunits? For example, a Western blot against the heterotetramer using 7B1 as the primary antibody would reveal to which subunit it binds, and the same could be done for 10D4. 5) It is evident that the single Fab was essential to break the pseudo-symmetry and make particle alignment possible. However, could the authors clarify why a second Fab was used in the final structure? While two Fabs in combination would have been useful for identifying the subunits, it does not seem that the Fabs were used for this purpose; rather, the glycosylation sites were used. 6) Figure 4—figure supplements 2-5 show very nice high-resolution features in the map. These features are presumably taken from the fully B-factor sharpened maps shown in Figure 3—figure supplement 1, and not from the lower B-factor map presented in Figure 4 and Figure 4—figure supplement 1. To orient the reader, perhaps the authors could show a larger zoomed view of the full, final sharpened map to accompany these high-resolution sub-regions. This would also help give the reader a better impression of the final map. 1) The TMD of the structure is poorly resolved, preventing analysis of the ion selectivity and permeation path in this region. The authors state that "The TMD is not very well ordered, hampering our ability to model the TMD and assign a functional state of the channel". However, in the Abstract the authors concluded that the reported structure was in a resting state. While this conclusion may be inferred from the functional study, this statement should be tempered or removed from the Abstract. On the other hand, the 2D class average result in Figure 1E suggests that the TMD is not disordered. Based on Figure 3—figure supplement 1, the final reconstruction is from about 250k particles, which is large enough for a further 3D classification. Another round of 3D classification with a local mask on the TMD may further improve the resolution of TMD. The 2D class averages do not show clear and continuous features representative of membrane-spanning domains (please see a panel from Author response image 1E and a comparison figure of a 2D class average from a recently published mitochondrial calcium uniporter structure PMID:29954988). Nevertheless, we made great effort to resolve the transmembrane segments, including 3D classification with a local mask on either the entire TMD or the TMD segment near the intracellular side of the membrane-spanning domain. We also performed focused classification of the TMD region and signal subtraction of the ECD. Despite these efforts, we did not obtain improved resolution in the TMD region consistent with unresolvable conformational heterogeneity. We have also revised the text to state “The TMD is not well ordered, hampering our ability to model the entire TMD region and assign a functional state of the channel.” We are committed to resolving the TMD region of ENaC to understand the mechanism of ion selectivity that is vital for its role as the rate-limiting step of Na+ reabsorption. Selected 2D class averages of ΔENaC. (a) The 2D class averages of ΔENaC do not show clear and continuous features representative of membrane-spanning domains. (b) Supplementary Figure 4E from Yoo et al. 2018, PMID:29954988. We are grateful to the reviewer for pointing this out and have incorporated a brief discussion related to a mutation located in the ECD that underlies Liddle’s syndrome (–subsection “ENaC Structural Overview”, third paragraph). The revised text now states, “Underscoring the importance of the wrist region and the critical roles that disulfide bridges play in maintaining the structural and functional integrity of ENaC, alterations of a conserved cysteine, α-Cys479 to an Arg, causes Liddle Syndrome due to a missense mutation that not only eliminates a disulfide bridge located at the juncture of the thumb and palm domains but also introduces a bulky positively charged residue (Salih et al., 2017) (Figure 5A).” We note that other disease-associated mutations are in regions of the channel that are not resolved or are not present in the structure reported here. We appreciate this point and have carried out several experiments to define the function and localization of ΔENaC. First, we note that extensive experimentation has found no evidence for ΔENaC ion channel activity in either GnTI- HEK cells or in Xenopus oocytes. By contrast, we have measured robust Na+-selective and amiloride-sensitive current when FL-ENaC is expressed in GnTI- HEK cells (Figure 2—figure supplement 2A, B). Because HEK cells are better suited to defining whether ΔENaC trafficks to the plasma membrane, we carried out the following experiments on ΔENaC and FL-ENaC expressed in GnTI- HEK cells using confocal microscopy. To ensure robust expression, we transduced the HEK cells with baculovirus encoding the ΔENaC and FL-ENaC proteins, taking advantage of the N-terminal eGFP in the Δγ subunit and the N-terminal eGFP in all three FL subunits to visualize expression, respectively. We used wheat germ agglutinin (WGA) labeled with Alexa Fluor 647 to label the plasma membrane of cells (Figure 2—figure supplement 2C, D). Based on eGFP fluorescence, we observed robust expression of both ΔENaC and FL-ENaC (Figure 2—figure supplement 2C, D). We next employed tetramethylrhodamine (TRITC)-labeled 10D4 mAb, an antibody that we know binds to the extracellular domain of ENaC, to probe the plasma membrane localization of ENaC channels. Indeed, we observed overlapping signals from both eGFP and TRITC-10D4 mAb in cells expressing FL-ENaC but not in cells expressing ΔENaC. Based on the confocal imaging results, we show that ΔENaC is not trafficked to the plasma membrane. We have included these results in Figure 2—figure supplement 2. We have also included text describing the results of the live confocal microscopy in the– first paragraph of the subsection “Functional characterization of ∆ENaC”. We have made multiple, distinct efforts to identify ENaC subunits. We have used 12 sites of glycosylation and 16 Phe, Tyr and Trp residues, in addition to 11 well ordered Arg residues, all of which are subunit specific, to conclusively identify subunits in this trimeric complex. We have provided examples of differences in the palm domain between the three subunits and the corresponding positions of the aromatic and basic residues (Figure 4—figure supplement 1D-F). In addition, we have used our mAbs to independently identify the subunits. Even though the mAbs 7B1 and 10D4 recognize tertiary epitopes and thus are not robust probes for Western blotting, as described in the last paragraph of the subsection “Design and expression of ΔENaC” in the Results section and in the subsection “Generation and isolation of Fabs” in the Materials and methods section, the 10D4 antibody is weakly Western positive. By Western blot analysis we show that the 10D4 mAb recognizes a band near the 75 kDa MW marker, at a position that we have previously shown corresponds to the β subunit (Author response image 2A), thus providing evidence that the 10D4 mAb binds to the β subunit. We next tested whether 7B1 and 10D4 bind to homomeric FLα by FSEC and found that only 7B1 binds to homomeric FLα based on the peak shift (Author response image 2B). Together, our Western blot and FSEC results confirm our previous conclusion that 7B1 and 10D4 bind to α and β subunits, respectively. In combination with our analysis of the density maps, we have evidence to unambiguously identify the subunits in the complex. The mAbs 7B1 and 10D4 bind to the α and β subunits, respectively. (a) Western blot of purified ∆ENaC probed with the 10D4 mAb. The band detected resides near the 75 kDa MW marker indicating that the mAB 10D4 binds to an epitope in the β subunit. (b) Representative traces of FL-α (black) expressed in oocytes. The 7B1 Fab binds to FL-α based on the peak shift to the left (red) while 10D4 Fab does not (blue). We agree with the reviewer and provided additional figure panels in Figure 4—figure supplement 1D-O as well as a video to help orient the reader. We thank the Multiscale Microscopy Core (OHSU) and the Advanced Light Microscopy Core (OHSU) for support with microscopy and the Advanced Computing Center (OHSU) for computational support. We are grateful to L Vaskalis for assistance with figures, to D Cawley for monoclonal antibody production, to D Ellison, M Mayer and R Goodman for advice, and to A Bouneff for naming the GRIP domain. We also want to thank the members of the Gouaux and Whorton labs for helpful discussions. This work was supported by the NIH (IB, DP5OD017871). © 2018, Noreng et al.